Donald Dell, one of the forefathers of sports marketing, is out with a new book entitled "Never Make The First Offer." "you got to be very careful when you make that first offer, which I never want to do. I want them to tell me what they have in mind. Occasionally you'll make an offer, but I don't like to make an outrageous offer. I like to, as I tell them, I don't want to come in and, you know, ask for a hundred and really hope to get fifty. They offer 10 and we split the difference. I just I don't like to negotiate that way. I don't think it's the best way to operate. So I like to come in with a realistic number that I feel is reasonable under the circumstances, but it helps me knowing that to hear what they say first." Having been on the both sides of the sponsorship table, I believe Dell is right on - the offer is the most treacherous part of any negotiation. Doesn't matter whether you're selling talent, sponsorships, cars, books...whatever. "You want to - really it's a question of listening and learning by the other person making the first offer. That's really the purpose of it, is to learn some information by not opening the offer," Dell said. Despite this, other networks want you to lay out your full offer WITHOUT knowing who you are negotiating with. Rather than peaking their interest and connecting you with partners around shared interests, they'll let you lay all of your cards on the table... setting up a nice informational disadvantage for you! So here's why we believe putting a fully-leveled offer out on the internet by posting a mish mosh of benefits attached to specific prices, is a very, very bad idea. You lose ALL OF YOUR LEVERAGE! Can you negotiate up from that price? Perhaps. Is it likely? No. We've all been in the position where we make a first offer that gets instantly accepted and then we wonder if we set our price too low. If we set the price too high, we run the risk of scaring off potential buyers. When you lay all of your cards on the table without any information about the other party's interests, you are setting yourself up for failure. "This method permits you to reach a gradual consensus on a joint decision efficiently without all the transactional costs of digging in to positions only to have to dig yourself out of them." Do we really want sponsorship to become a used car lot where we negotiate around positions and price points? There can be a better way! Properties: despite what other sites and social media people want you to believe, sponsorships aren't a commodity business. We're not buying widgets here. Sponsorships take real, live negotiation based on shared interests. Ask anyone and they will tell you that is how the best partnerships are formed. Our goal is to help connect you with partners that share your interests, without putting you in a bad negotiating position. Afterall, don't sponsors already have enough of the negotiation power as it is? Another recently launched site wants you to buy and sell sponsorships via a PayPal button. If this becomes the norm, then you'll be out of a job and sponsorships will be called advertising. Sound good to you? Sure, levels are easy to mix and match and throw up. But how effective are they when they make your intended audience throw up? In a recent post on sportsnetworker.com, I offered 10 or so terms sponsorship pros should consider and to my surprise "levels" got the most attention! 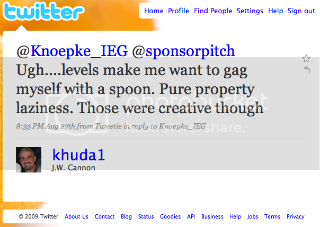 At SponsorPitch, we've made the decision to allow you to express your assets in an open format as the starting point for sharing information, a negotiation, a long term relationship, whatever. What's open format mean? A carefully crafted mix of video reels, descriptions, pictures, presentations, assets and the right hard information. We've included a price range, rather than a specific price point at the request of a few users. Why - because levels are the old way of doing sponsorship and offering price points before knowing who you are negotiating with puts you at an INSTANT DISADVANTAGE (unless you're a used car salesman, in which case everyone knows your first offer is BS anyway). There are too many variables - how much will they activate and how should I value that? 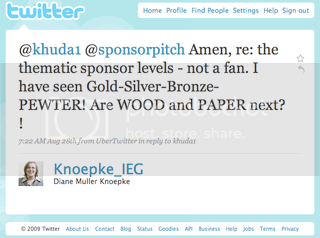 Will they indirectly justify my opp or directly help me bring in other sponsors? can we revenue share? Do I have to have sponsors from certain categories and isn't price dependent on category? This is really just the tip of the iceberg, as you know if you've been in the industry for a few days. Starting a negotiation on price is not a good idea and we've seen the effects of that to our industry's detriment. “There has been little work done to help a brand use sport to form the basis of a marketing strategy, other than saying, ‘We want $30 million for the front of the shirt because . . . well, just because,'” Former A-B Sports Marketing Chief Tony Ponturo recently said. At the end of the day, you can have the nicest car lot in town, but if you're getting a bad deal - you're still going to feel bad walking off the lot. We think putting specific uninformed offers online sets you up for a bad day. We don't think a first offer is in every instance a bad thing (in fact, properties in general must make the first offer), but we think an uninformed offer IN EVERY INSTANCE is a bad thing.